The most irritating part about images is that they are very large in size. Especially if you own a DSLR camera, you will definitely face this problem where the file size is in MB's. They not only occupy unnecessary space in your phone memory but they also ruin user experience by damping system speed and slowing down the performance. It become hard to upload those images on social media sites in 2G internet connection. How can we upload 8+ MB size photo, no way. On the other hand, If you're a blogger or web-developer, you may know it very well that how badly images can affect your website loading time. So its better to optimize all images before using them anywhere. Now let me ask you one simple question. 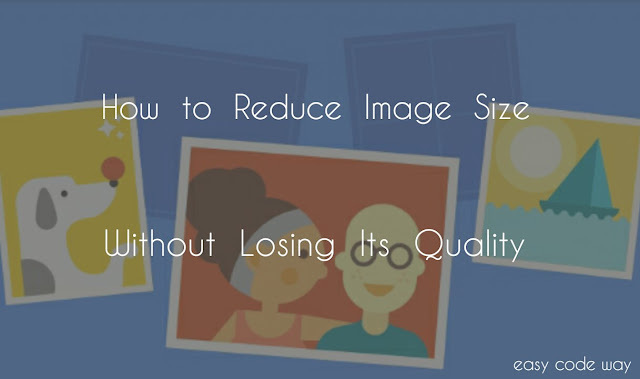 What will you do to reduce your image's size? Many of you may answer that you'll change their quality or re-size them by using third-party applications. But my friend, it's not the proper solution. You have to lose quality. Again a big no from my side. Now Imagine how it would be to reduce images size without losing their quality. Sounds good and bit unrealistic too? But this magic is possible. In today's tutorial, I will guide you how to do that. So lets start now. Before moving to the steps, first let me tell you about the tool we are going to use here. Actually its an online website named as JPEG Mini. It can reduce your image size up to 5X times and this all thing will hardly take your one minute. Moreover, you don't need to waste your internet data and time by downloading those third-party apps. Another interesting thing is that, this method can work in your Android phone as well as on your Computer or Laptop. All what you need is proper internet connection. 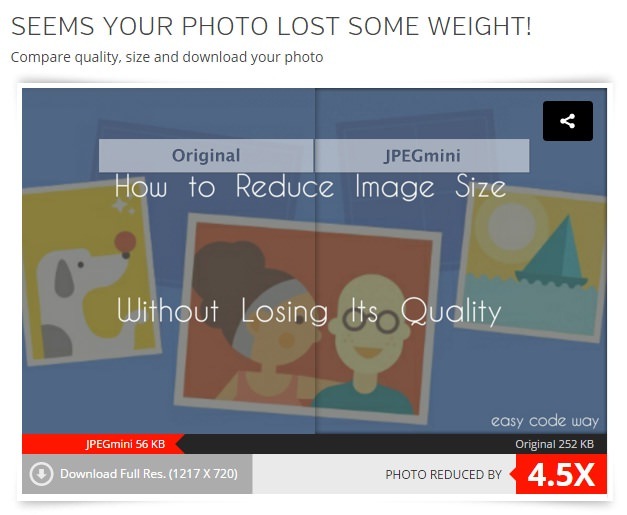 Below are the step by step instructions to reduce image size with JPEG Mini. First of all, go to JPEG Mini website. Now click on "Press to Upload Photos" button. From dialog box, find and select the image whose size you want to reduce and upload it. After this, wait for few seconds and let it do magic for you. Finally, click on "Download Full Res." button to save reduced size image in your system and that's it. You can also compare the quality difference between the original and reduced image. It would be almost same. At the bottom line, you can also analyze the difference between their size. As you can see in above picture, my photo has been reduced by 4.5X times which is around 252-56 = 196KB. Another thing I had noticed is the new file name. You'll find "_mini" suffix added after the name. For example, if your original file name is "Vivek.JPEG" then your new file name will be "Vivek_mini.JPEG". You can change it to original simply by renaming it. The most weird thing about this tool is that it accepts JPEG images only. So if you've other formats images, it may display an error message as "Please select a JPEG file". To overcome this problem, change the format of photo by renaming it. Now imagine if you have 100+ files. Of course, It would be a tedious task to change their file formats one by one. but don't worry dear. In my previous post, I had already discussed on this topic and you can change multiple file formats at once with the help a simple windows batch program. You can read that article to troubleshoot this problem easily. Now its your turn to try this amazing trick. 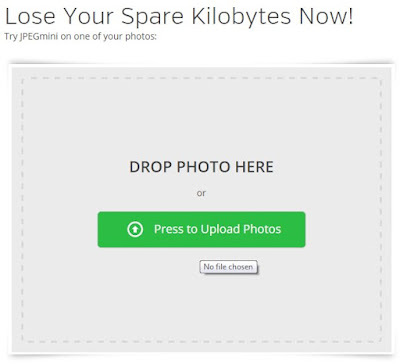 Go and reduce your photos spare kilobytes. If you're facing any problem, fell free to ask me in below comment box. I am always here to help you. Love and blessings!